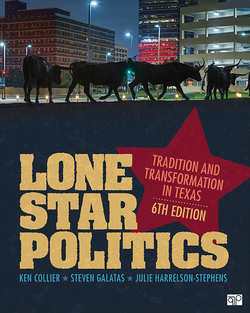 Three Stephen F. Austin State University Department of Government professors published the sixth edition of the textbook "Lone Star Politics: Tradition and Transformation in Texas." Drs. Steven Galatas and Julie Harrelson-Stephens, associate professors, and Dr. Ken Collier, professor, published the first edition in 2008, and now more than 10 years later the newest edition is on its way to universities across the state. "We're especially proud of our textbook because it helps get SFA's name on campuses throughout the state; particularly two-year colleges where many of our transfer students come from," Collier said. "We're happy that students at competing universities are reading our textbook." The sixth edition expands its coverage on civil rights and examines the relationship between state and federal and local governments. The textbook is available for purchase through sagepublishing.com or on Amazon.